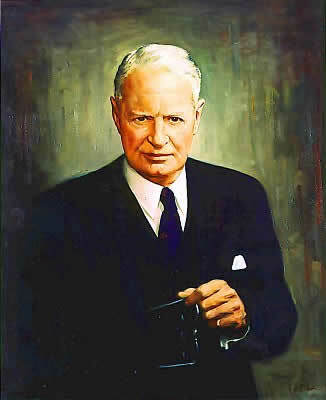 May 25, 1961, Washington, D.C.
David Lynn was appointed Architect of the Capitol in 1923 by President Calvin Coolidge to fill the vacancy caused by Elliott Woods' death. Like his predecessor, Lynn was not an architect but had worked his way up through the ranks to become the agency’s number one assistant at the time of his predecessor’s death. Lynn’s tenure was marked by the growth of the U.S. Capitol Grounds and the construction of major buildings for the U.S. House of Representatives (the Longworth House Office Building), the U.S. Supreme Court, the Library of Congress and the U.S. Botanic Garden. In addition, the First Street wing of the Russell Senate Office Building was built, the Capitol Power Plant was enlarged, and construction on the Dirksen Senate Office Building was begun. The U.S. Capitol Grounds were again expanded, and underground parking for Senate employees was provided. Lynn also supervised the redesign and reconstruction of the House and Senate Chambers. Born in 1873 in West Virginia and raised in Maryland, Lynn started his career at the U.S. Capitol soon after finishing high school. He began as a laborer and rose to the rank of engineer by 1910. After 31 years as head of the agency, Lynn retired in 1954 and died in 1961.